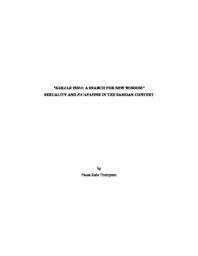 This study is a theological and cultural analysis of sexuality and fa'afafine (effeminate male, third gender) in the Samoan context. Specifically, the study focuses on sexuality in Samoa through the lens of social justice. The voices of the fa’afafine community are highlighted to understand the tension between Samoan church and culture, and sexuality. It is the contention of this study that the experiences and agency of fa’afafine in Samoan culture and church can provide the groundwork for a more affirming ethic of sexuality. The author, a Samoan clergy member, seeks to answer two probing questions: 1) Is the Samoan culture and faith inclusive of people regardless of gender, and sexuality? And 2) what does that inclusivity look like through the lens of social justice?